Kids in ALL grade levels should have access to technology. I’m talking about the kind of technology that allows kids to create and explore what they are learning about. So often I hear about districts not giving students access to Chromebooks until the kids are in second or third grade. I have heard excuses of not starting to introduce creation tools to Littles because there is so much other stuff to do and because it’s too hard for them and takes too long. It takes a shift in mindset to BELIEVE Little kids CAN CREATE and do mind blowing things with technology. For some people, it takes some seeing to believe. Show the World What YOUR Littles are Doing! If you haven’t already, you should go check out the #GAfE4Littles hashtag on Twitter. Educators, coaches, etc are sharing about how their Littles are creating with Google Apps and engaging with other forms of technology. It is truly amazing how the community and number of advocates continue to grow! The resource can serve as a tool for the PLN (professional learning network) if they share ideas, templates, Twitter handles, etc. It can also fall into the hands of someone who really needs to see this resource. 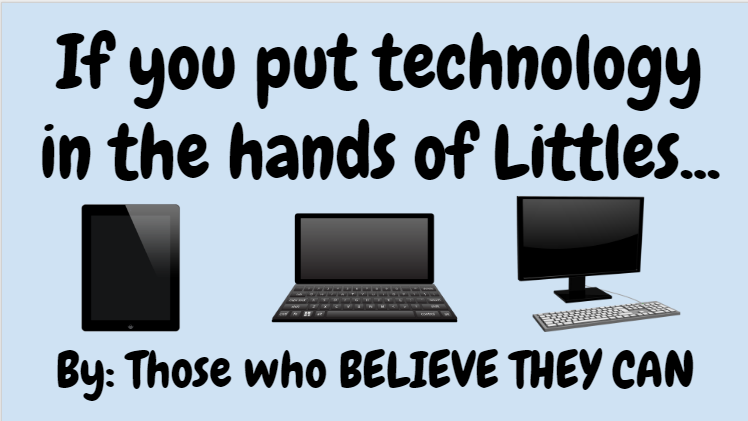 Someone who needs to be inspired that there are Littles from all over who are using technology meaningfully. Someone who is a technology director or an administrator who needs to realize that kids who are in 2nd grade and lower can definitely use technology in more ways than just playing games. This entry was posted in PLN, Technology Resources by Christine Pinto. Bookmark the permalink.